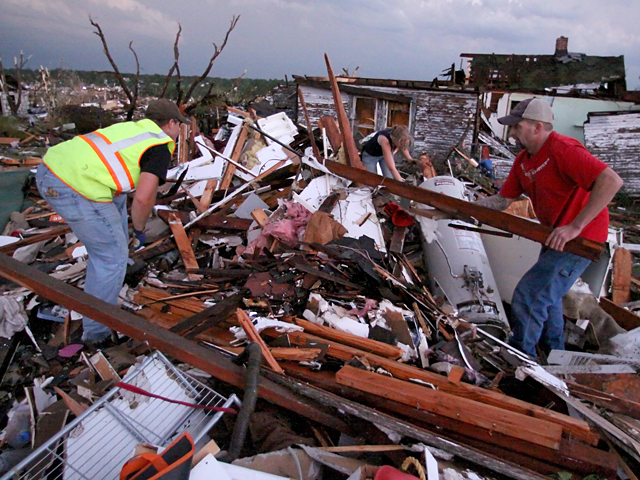 Residents of Joplin, Mo. woke up Monday to devastation left behind by a powerful, deadly tornado that cut a path of destruction and destruction six miles long and half-a-mile wide. It left scores dead, a hospital evacuated, homes, schools and entire neighborhoods flattened. The governor has declared a state of emergency and the National Guard has been called in. "One minute," said one man, "it was barely sprinkling, and the next minute, boy, just the whole world turned upside down. ... (I heard) just a really loud roar." A so-called storm-chaser -- someone who drives around hoping to capture twisters on video -- caught the one heading for Joplin and was amazed, saying, "Oh gosh -- that is a monster tornado. ... oh my gosh!" Surveying the damage, he exclaimed, "Bad. Oh my gosh. This is awful." Sara Ferguson was at church when the storm hit. The sight of widespread destruction was overwhelming as she made her way home. "I just started weeping," she says. "I've seen pictures of this before, but to actually see it in person, it was devastating. It just looks like a war zone." Dozens of the victims were in a shelter at Missouri Southern State University, where Marie Colby is a Red Cross volunteer. The twister destroyed her apartment, so she's homeless, too. When the tornado hit, she told "Early Show" co-anchor Erica Hill, she was in her car, under an overpass. "We saw the tornado come," she recalled. " ... Cars were just flying everywhere. Debris flying everywhere. (Semi-trucks) were completely picked up - just thrown, tossed all over. They were turned every which way. There was one slammed down right in front of us on its side." As soon as the tornado passed, Colby says, she got out of her car to help the driver of one semi get out, through his windshield. At St John's Regional Medical Center in Joplin, hundreds of windows were blown out, the roof was ripped up and the medivac helicopter destroyed. The facility was abandoned, and almost 200 patients transferred elsewhere. Spokesperson Miranda Lewis told "Early Show" co-anchor Chris Wragge, "We had heard that the hospital was hit. But really, I wasn't prepared for what I found here. It's devastation. ... There are cars upside down, wrapped around trees. Most of the hospital is devastated." It appears, Lewis says, the hospital took a direct hit.